Individual cakes oozing with chocolaty goodness! Top with a dollop of whipped cream and fresh berries if desired. FILLING: Melt 2 oz. chocolate with heavy cream in a double boiler over simmering water. Whisk gently to blend. Refrigerate for about 2 hours, or until firm. With your hands, form into six balls, refrigerate until needed. CAKE: Preheat the oven to 400 degrees. Spray six 4-ounce ramekins or custard cups with cooking spray. Melt 4 ounces of chocolate and butter in double boiler over simmering water, whisk gently to blend. In a large bowl, with an electric mixer, beat whole eggs, egg yolks, sugar, and vanilla on high speed for about 5 minutes, or until thick and light. 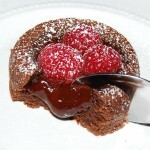 Fold the melted chocolate mixture and flour into egg mixture just until combined. Spoon the cake batter into the ramekins. 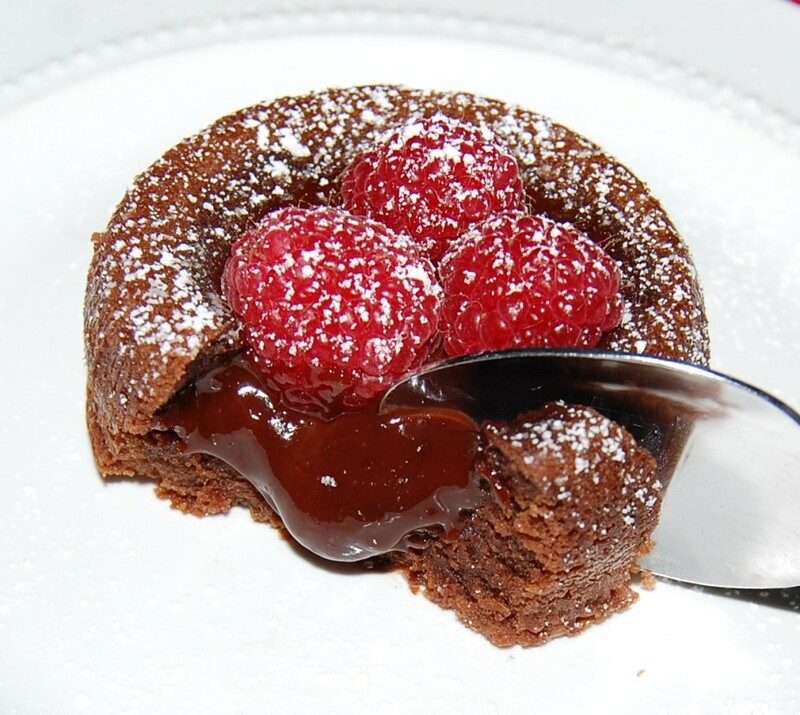 Place a chocolate ball in the middle of each ramekin. Bake cakes for about 15 minutes or until firm to the touch. Remove from the oven and let sit for about 5 minutes. Run a small sharp knife around the inside of each ramekin, place a plate on top, invert and remove the ramekin. Garnish cakes with raspberries and a dollop of whipped cream.